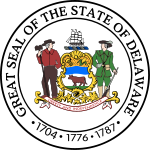 Delaware (/ˈdɛləwɛər/ ( listen)) is a state in the United States. It is sometimes called the First State because it was the first colony to accept the new constitution in 1787. Its capital is Dover and its biggest city is Wilmington. It is the second smallest state in the United States. The Dutch first settled Delaware. The Swedish then took over in the mid-1600s. Delaware is 96 miles (154 km) long and ranges from 9 miles (14 km) to 35 miles (56 km) across, totaling 1,954 square miles (5,060 km2), making it the second-smallest state in the United States after Rhode Island. 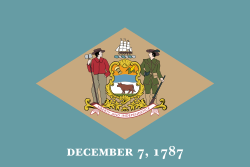 Delaware is bounded to the north by Pennsylvania; to the east by the Delaware River, Delaware Bay, New Jersey and the Atlantic Ocean; and to the west and south by Maryland. Delaware is on a level plain, with the lowest mean elevation of any state in the nation. Its highest elevation, located at Ebright Azimuth, near Concord High School, is less than 450 feet (140 m) above sea level. ↑ Nann Burke, Melissa (January 5, 2015). "Delaware a Small Wonder no more?". Delaware Online. Retrieved March 10, 2015. ↑ USGS, Howard Perlman,. "Area of each state that is water". water.usgs.gov. ↑ "Delaware: Population estimates". U.S. Census Bureau. July 1, 2017. Retrieved May 6, 2017. ↑ 6.0 6.1 "Elevations and Distances in the United States". United States Geological Survey. 2001. Archived from the original on October 15, 2011. Retrieved October 21, 2011. ↑ Schenck, William S. Highest Point in Delaware. Delaware Geological Survey. Archived from the original on October 20, 2008. https://web.archive.org/web/20081020055243/http://www.dgs.udel.edu/publications/Pubs/FactSheets/HighestPoint.aspx. Retrieved July 23, 2008. ↑ 12.0 12.1 "Extreme and Mean Elevations by State and Other Area" (PDF). Statistical Abstract of the United States: 2004–2005. United States Census Bureau. p. 216. Retrieved March 16, 2011. ↑ 13.0 13.1 Olson; D. M; E. Dinerstein et al. (2001). "Terrestrial Ecoregions of the World: A New Map of Life on Earth". BioScience 51 (11): 933–938. doi:10.1641/0006-3568(2001)051[0933:TEOTWA]2.0.CO;2. ISSN 0006-3568. Archived from the original on October 14, 2011. https://web.archive.org/web/20111014034322/http://gis.wwfus.org/wildfinder/. ↑ Montgomery, Jeff (May 14, 2011). "Cleaning up contamination". The News Journal. New Castle, Delaware: Gannett. DelawareOnline. Archived from the original on May 14, 2011. Retrieved May 14, 2011. The first online page is archived; the page containing information related here is not in the archived version. ↑ McDowell; Sen. McBride; Rep. George (March 22, 2011). "Mourning Those Lost in the Recent Earthquake and Related Disasters that have Befallen Japan, and Expressing the Thoughts and Prayers of All Delawareans for the Citizens of Our Sister State of Miyagi Prefecture During These Difficult Times" (published March 23, 2011). Senate Joint Resolution # 3. Retrieved April 22, 2011. This page was last changed on 25 January 2019, at 22:33.